The showdown with encroaching seas will be the topic when planners and others gather in San Mateo County Monday to talk about a battle plan for the coming decades. San Mateo could be "ground zero" for Bay Area impacts. Congresswoman Jackie Speier, whose district includes most of San Mateo County and who is co-sponsoring the conference with county supervisor Dave Pine, lists it among the nation's "top ten hotspots" for sea rise impacts. "We have got to get serious about anticipating that and doing our level best to prevent catastrophe," she said in a phone interview. 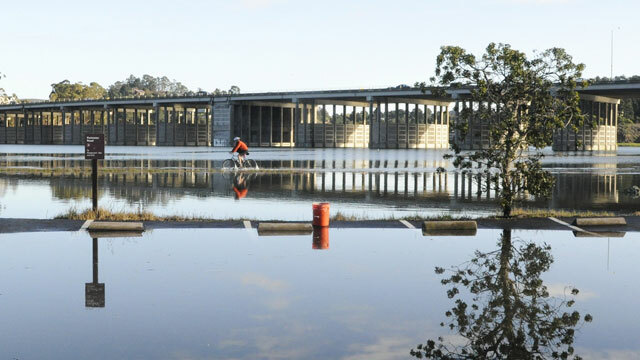 According to a Pacific Institute study, among California counties, San Mateo is tied with Orange County for having the biggest population at risk from rising seas. And unlike Orange County, San Mateo will get hit from both sides, with coastal erosion on the Pacific coast and more frequent flooding on the Bay side. 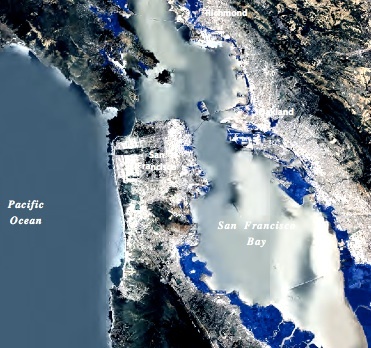 "By the end of the century, SFO (San Francisco International Airport) will be underwater if we don't take steps to address this," Speier says. The question remains: what steps? Options abound, from "hard" measures like sea walls and levees, to "soft" buffers such as expanded wetlands, to what planners euphemistically call "managed retreat," which is to say pulling things back from the shoreline. In sorting that out, local officials will get some tips from John Englander, whose eerily-timed book, High Tide on Main Street, pretty much laid out the whole scenario for Hurricane Sandy--a week before the "superstorm" hit the East Coast last year. Englander calls sea level rise the "most profound change" to the planet this century. In an interview, he offered some thoughts for planners confronting the problem. The fact that there is such a range to the projections, that official estimates say we could have 1-to-3 feet and some say 2-to-6 feet. That adds to the confusion. But the estimates, it turns out, are actually pretty cautious and I say, timid, because they don't count some uncertainties--the tipping points, the wildcards, which is the catastrophic melting of the West Antarctic Ice Sheet, which is showing signs. And methane, which is a huge accelerant to warming, and is not in the equations because we don't know how soon it will happen. Yet methane's escaping from the Arctic now, from the permafrost, from the sea bed. Because we don't know how quickly things will warm...maybe we should turn the question around and say, "We know we're gonna get three feet of sea level rise. We just don't know for certain whether it's gonna be by 2050 or 2150. And if we plan for three feet now and it doesn't happen 'til 2100, we'll be better prepared for storm surge and other events. So we just say, "How will we deal with three feet of sea level rise? Not knowing exactly when it will happen, we challenge ourselves architecturally and engineering-wise and planning-wise, to think bigger. This is unprecedented. It's never happened before in the history of human civilization. Buildings and infrastructure we amortize, typically over 30 or 40 years. Now that we know that sea level is rising...and can measure the warming and we know that [it] will rise for centuries, we need to think of coastal property almost like it's leasehold. We just don't know whether the lease is 50 years or 150 years. It is gonna be hugely expensive and I think we need to start talking about that because when people say it's gonna be very expensive to get off of coal and fossil fuels, we have to put into the equation the cost of relocating off the coast as the sea rises and the shoreline moves inland. We need to think in economic terms and I believe we should expose people to the choices and the cost because that will help us make intelligent and rational decisions. It'll be very different out here in the Bay Area from, say, Florida. For example, Miami 200 yrs from now probably won't be there, because it's only six feet above sea level and it's porous limestone. Sea walls don't work there, as I explain in my book. Here in the Bay Area--where you have a steep relief, the cliffs and so on, even though there's one low-lying reclaimed land--the Bay Area will be here 200 years from now, even if sea level is 10 ft higher, because you will have adapted to it. If we can see where things are headed--like any situation, even if we don't know the year--we'll do better planning, because we can plan incrementally if we can see the end, or where things will be 50 years from now. And if we look with a little bit of vision, instead of hiding or delaying or denying something, we can probably come up with some really creative structures that will last and get a better return on investment, and secure the Bay Area's position as very progressive and forward-thinking and not shying from technical challenge, and charting a brave new path. I think geologically and physically, as well as socially and psychologically, it's more doable here than anyplace that I've visited. NOAA has an interactive mapping tool where you can see the extent of coastal inundation at various levels of sea rise. And there are photos of encroaching seas in the Bay Area during ultra-high tide events at the California King Tides Photo Initiative website.